Cashback Reward : Earn up to 1,950$! 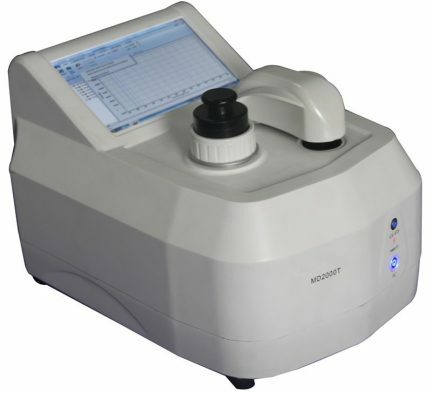 The MD2000 series spectrophotometer, is a new type full-spectrum (190 – 850nm) spectrophotometer, with an integrated computer system, screen and four USB interfaces. It can be connected with a mouse, printer, U disk and other wireless card or USB devices. It has a built-in software, so it does not require any softwre installation before being able to use it. The spectrophotometer has two inspection form, including trace mode and colorimetric dish. It does not need dilution and baseline correction. Components include a built-in US-imported high precision progressive motor, low noise, long service life, automatic mixing and temperature control function. All acquired data is automatically saved. The instrument provides convenient data output statistics and user-friendly software. Where A is the measured absorbance, ε is the molar absorption coefficient, b is the path length, and c is the concentration. A260. The concentration and purity of dsDNA, ssDNA, RNA and others. Micro Array. The concentration of fluorescent dye labeled nucleic acid (micro array), for it can measure the concentration of the nucleic acid and the dye at the same time. Protein Kit Method. The concentration of protein with protein assay kit (Lowry, BCA, Bradford and Others), and the software can create standard curves and report directly the concentration of the sample. The UV/VIS can perform a full-spectrum (190 – 850nm) absorbance scan. It can measure the concentration of suspended cell cultures. The instrument can make time-based kinetics measurements. The software only support kinetics measurement using the cuvette module.